But if Moloch wants them then they have to stop him – or any other dark forces seeking them. There is always a difficulty when adapting a TV series to book form in capturing the characters as they appear on screen – and this book has made it harder by having multiple points of view. I was actually impressed by how the book generally got it right and I could believe these were the characters on screen – generally. The slips that caught me were largely due to Crane – his language is usually beautifully archaic and elaborate but at times it goes quite ridiculously over the top, even for him, that jars me. Worse, in a chapter from one of the other characters that follows Crane, some of the tone will bleed over – so we’ll have Abbie or Jenny or Frank speaking and thinking with Crane’s very very out of place language. At times this also combines with some over-descriptiveness or general clumsiness to make some very clunky lines. Despite these slips, I think it does a great job of continuing what we saw on the show and almost filling the gaps. A TV show is, by definition, limited to how much of a character’s thoughts it can show, unlike a book. With these POV shifts we got to build on the characters we’d already seen – so we not only have the rather comic depiction of Ichabod struggling with the modern world but also the frustration of it (even things we don’t think of like the sheer size of the population). We have a lot more of Abbie and Frank’s rapid adaption to the existence of the supernatural and trying to deal with how it has changed their lives, their jobs even their ambitions and aspirations, hopes and dreams. We have Frank’s shock and sadness over his daughter’s injury and disability. We have Abbie and Jenny’s fraught yet loving relationship writ much larger when we’re in both of their heads – the love, the guilt, the resentment all mixed together painfully as well as Jenny’s respect, admiration and bond with the old Sherriff also made really clear. 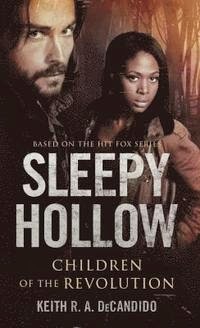 I liked it, I don’t know how much the show considers this book to be canon, but it really is an excellent book for development and enrichment of these characters and the conflicts and challenges they face and the adaptations they’ve had to made. I think the book is worth reading just for that. I even quite liked the characterisation of the antagonists in this book – obviously we have the same demons and monsters as the show that are pretty much one dimensional in terms of what they do and why – they’re evil (and on the opposite side we have the ridiculously deified and sanctified American revolutionaries who save the world from eeeeeviiil which we’ve commented on in the show as well) but the human cultists are much more humanised and real. I also quite liked how they’re adapting the world setting – particularly how characters outside the core cast are noticing that Abbie and Frank are involved in the very weird cases – it’s not just happening and everyone else has some weird amnesia or selective blindness. Unfortunately, like every other show-to-book adaptation I’ve read, it also suffers from a gross amount of recap, call-backs and shout outs to the original show. And not just to events that are directly relevant to the plot of the book – I think every character, every episode and every conflict that aired on the show was referred to at least once in the book and sometimes several times over. It was unnecessary and felt far too much like the author was trying to draw unnecessary extra connections to make it clear it was a book of the show. It slowed down the plot and wasn’t really necessary. I did like some of the show call outs though – like Frank snarking about Crane’s aversion to ever actually changing his clothes and people commenting on what a weird name “Ichabod” actually is. We have the same diversity as the show – so Abbie, Jenny and Frank are all Black and all have been developed with some complexities – perhaps more on the show since we get to see inside their heads. There’s also a large cast of supporting characters that are POC, security guards, other police, passers by, victims, employees in the museums – the cast at every stage is racially diverse and contains several women which surprised me. I also liked how even some of these were developed – even those who were just going to be fodder for the murderous rampage – we didn’t get to see them as just faceless names, random bodies that litter any supernatural drama. We got names, we got history and family and backstory (I especially liked one security guard who had a whole story linked to class, the economic down turn, a torn family and having to try and make ends meet when everything fell apart and she was the fallout in so many other people’s mistakes and terrible actions). This book has a decent story and decent writing (with a few hiccoughs) but it’s an excellent way to get to know these characters a little more. If you’ve watched the show it’s a great little companion book to expand and add texture to what we’ve seen. If you haven’t, it’s probably not an ideal choice.